Medieval illustrations languished for centuries, admired only by art collectors and scholars. In the mid-20th century, microfilm copies of these fragile texts allowed scholars around the world to study them, albeit in black and white, and at frustratingly low resolution. It took Internet culture, with its taste for humor and mad animals, to create a real, widespread interest in not just medieval art, but the odd little illustrations found in illuminated manuscripts. Oddly-faced cats assemble now for Buzzfeed lists, and any child may learn that knights fought snails in the margins of books. Whenever we doubt that the Internet has brought us good, we might remember this. Christian Heck and Rémy Cordonnier have chosen a fine moment to publish their volume of medieval illuminations. Public interest is surely at an all-time (without exaggeration) high, and printing technology has finally made high-quality, full-color reproductions affordable. And what a beautiful work they have assembled. The Grand Medieval Bestiary is a treasure of a book. Its illustrations are huge, encompassing whole pages and two-page spreads, vividly colored and often enlarged from the original versions. Here are all of the animals. They dance in the margins of devotional works. They leap into human scenes, creating joy and chaos. They smile through careful studies of the universe, refusing to submit to realism or perspective. Medieval art isn’t known for its photo-realism, or anything like it, but the strangely warped style is deeply evocative. Tongues extend and wild eyes search the world with human intensity. If the animals themselves had created books, this is how they might have rendered themselves on the pages. The book is divided into two parts. The first, “Man and Animal in the Medieval World,” discusses animals’ symbolic and cultural importance to the European medieval mind. Each chapter is a detailed, scholarly essay: “Poetry, Symbols, and Presence in the World”; “A Venerable Companionship, Ceaselessly Reinvented”; “A Geography of the Cosmos: Observation and Myth.” The illustrations that accompany this are clearly intended to provide context. For a non-scholarly reader, though, it is the illustrations which carry the most interest. The second, longer part of the book is “One Hundred Beasts,” a catalogue of animals that explores the meanings of individual animals, each accompanied its own series of vivid illustrations. The animals convey religious, symbolic, mythological, and literal messages. They bring the strangeness of a largely unseen world to European readers. And they dance across the pages: owls and basilisks, elephants and hedgehogs (and porcupines! ), pelicans and turtles. One hundred animals and kinds of animals fill five hundred pages with their images and natures. Imaginary creatures accompany everyday companions, to magnificent effect. Heck and Cordonnier’s creation allows modern readers to understand a little of the preciousness of a medieval book. Although The Grand Medieval Bestiary is not hand-illustrated on scraped and pounded animal skin, the book still draws attention to itself as an object in a way that few modern books do. Readers are drawn to stroke the illustrations and admire the pages. 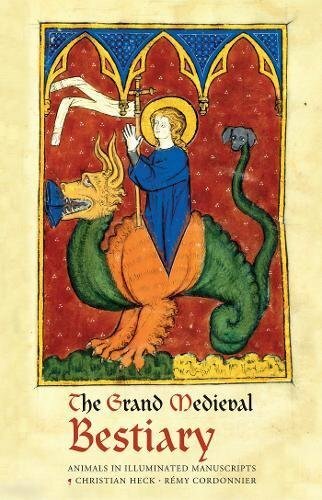 The Grand Medieval Bestiary feels magical, valuable, and important.